“Mirror, mirror, on the wall – who is the fairest of them all?” If you’re the Queen of the Follies, you sure aren’t the apple of the King of Wall Street’s eyes. You know who is? The titular character, Samantha White, or Snow as she’s known to most. The girl who has everything the Queen of Follies want. The girl who’s story follows the Snow White fairytale, but set in Depression-era Manhattan. The story is conveyed through gorgeous artwork of watercolors, pencil, ink. The art is so fantastic. It uses a range of tools—pencil, ink, watercolor—to convey the noir-ish atmosphere, sticking with blacks and whites, and it does a beautiful job blending it together. It kind of makes the scenes seem like it’s a dream. The art does not strictly adhere to panels; it lets loose and takes up entire pages. The art automatically transports you into this world—no more glitz and glamour, only gloom of the Depression—with people dealing with the aftermath of the Stock Market crash. Readers will really feel it. It retells the story of Snow White but sets in in Depression-era Manhattan. This graphic novel may be set in a Depression-era Manhattan, but everything and everyone in this will remind you of the Snow White fairytale. Snow is Snow White. The Queen of the Follies, the star of the theatrical productions on Broadway called Ziegfeld Follies, is the Evil Queen, who is jealous of Snow. The seven young street urchins that saves Snow White from ruffians are the seven dwarfs (they were my favorite part!). And so on. 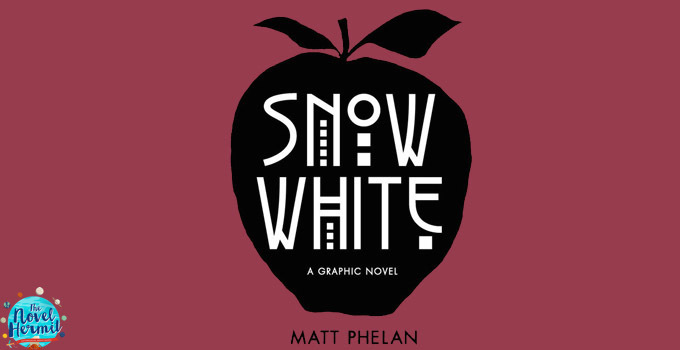 The story doesn’t stray far away from the original fairytale nor of the classic elements readers find in Snow White, which is good, but I thought Phelan could’ve done more to make it his and more creative. The story makes you feel like you’re watching a silent film. Snow White: A Graphic Novel feels like a silent noir film. The art does a beautiful job of doing that. It’s nothing but black and white art with the occasional pop of red for certain objects, and limited dialogue and narration. There may be dialogue, but the art is the thing doing the speaking and conveying. Snow White does not make good use of the time period. Phelan didn’t play up the setting as much as I expected him to. Sure you get art that conveys that we’re in the late 20’s like the way the people dressed and the cars and such, but it wasn’t enough. It played it too safe. Yes, there isn’t any glitz and glamour during the Depression, but give me more setting! Give me some more historical footing in this world. Total lost opportunity. The lettering doesn’t fit. In the advanced reading copy I read from, the font is quite jarring and doesn’t feel like it’s a good fit for the era of the story it’s set in. It’s too modern, which distracts me from the art and the story. I wish a different font was chosen so it didn’t do that. Who will love this comic? Readers who are looking for a quick Snow White retelling, want to see excellent black and white watercolors, like silent films, or want to see how Phelan conveys the time period and setting of Depression-era Manhattan. Are you convinced? Add to your TBR on Goodreads. Go buy Snow White: A Graphic Novel from your local comic book store, or these online retailers: Amazon · Barnes & Noble · The Book Depository · Indigo. Or borrow it from your library. Are you excited about this graphic novel retelling of Snow White? Snow White sounds pretty fascinating! What I’m particularly drawn to is the art style you’ve described. I think it’s really cool that there’s a mix of mediums, and it does seem to fit the setting of the story. I don’t know whether I’d prioritize reading this, since I’m not a truly big fan of the Snow White story in general, but I definitely think I’ll at least keep it on my consideration list of graphic novels to check out! Seems really interesting, but I’m not sure I could handle the font if it is really distracting. Thanks for sharing!! !